As you probably known by now, I love dragons. All dragons. Big dragons, little dragons, fire-breathing dragons, scary dragons, cute dragons. All of them. So it probably doesn't come as any surprise that I've often wondered what it would be like for my favorite two dragons to meet. Smaug: "I am fire! I am death!" While I don't think Smaug and Toothless would become the best of dragon friends (Smaug is much too proud to admit friendship and Toothless is 100% loyal to Hiccup), I think their interactions would prove to be entertaining. At first, Smaug might go all fire-breathing dragon and threaten to incinerate him because he's just so sick and tired of pipsqueaks that smell like beard hair and axes waking him from his seventy-year naps. Toothless, of course, would not fear Smaug at all. He's dealt with much bigger dragons before and Smaug doesn't look nearly as intimidating as the Red Death or Bewilderbeast. After a few minutes of watching Toothless bumble around the caverns of Erebor, dive-bombing into the piles of gold and rolling around in the jewels, a piece of Smaug's (arken)stone heart would start to chip away. Come on, Smaug, You know you want to roll around in your gold. Smaug: "My teeth are swords." Smaug: "My claws are spears." Smaug: "My wings are a HURRICANE!" Smaug: "Do you think flattery will keep you alive?" This is pretty much Toothless' face the whole time. After some time, I think Smaug might get used to Toothless hanging around, even if he prefers to be alone. The caverns of Erebor are huge and quiet, so Toothless would have plenty of opportunities to get lost and leave Smaug to rest his old eyes a lot (after all Smaug is like hundreds, if not thousands, of years old [a proper dragon never reveals his age]; he's basically just an old man dragon yelling "Get off my gold!"). Toothless would bring fish from the lake for Smaug, and Smaug would refuse to eat it because there's no way to know what else Toothless has stuck in his mouth. But the moment Toothless wandered off, Smaug would devour the meal without hesitation because he really doesn't get out enough for a proper meal. Toothless might try to sneak up on Smaug, even though it would never work, and Smaug would pretend he didn't smell the smaller dragon coming. It gets lonely being the last of the great dragons, so Smaug would welcome a little entertainment even if it's from a pipsqueak dragon with half a tail and weird teeth. They would definitely challenge each other to hour after hour of riddles, especially so Smaug could show off how clever he is. Because he is the cleverest dragon ever; he'd never let a pipsqueak swindle anything from him, not even his dignity or the most precious jewel in the entire mountain. At some point, Toothless would end up on Smaug's back or head, curled up in a ball to take a nice, long nap together. Smaug would only pretend he didn't enjoy it. He could never, ever, for the dignity of all that is dragon left in the world, admit to taking part in "The Snuggles." 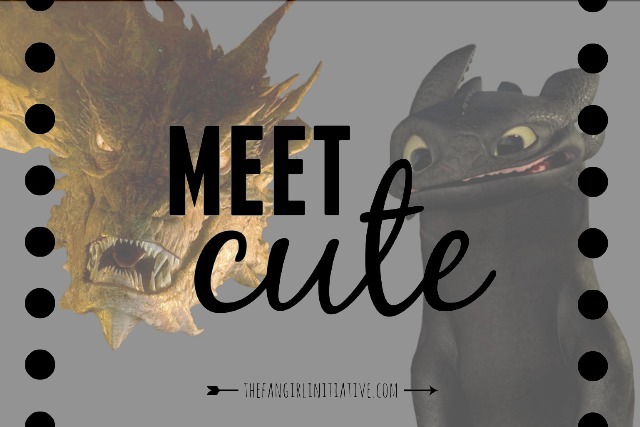 But as we all know, no one can resist the adorableness of Toothless. See, even Cloudjumper can't resist! Meanwhile, Bilbo and Hiccup would watch from afar and wonder at these two together. Bilbo: "Is Smaug with you?" Hiccup: "No, I thought he was with you." In the end, I think Smaug would try to act big and tough, but he really would feel a small amount of kinship with the playful Night Fury. After all, Smaug is considered a pretty small dragon in comparison to the other Middle-earth dragons (poor, whiny baby), just like Toothless is one of the smaller dragons of Berk. Still, Smaug would try to train Toothless to be a strong, mighty dragon. Smaug: "I kill where I wish, WHEN I wish! My armour is iron, no blade can pierce me!" Toothless: *shrugs* "I'm the Alpha dragon. I've seen bigger." Smaug: "But I am KING UNDER THE MOUNTAIN!" Toothless: *rolls eyes* "You are a drama queen." What else do you think Smaug and Toothless would do together? Let me know in the comments!